Our culture leads people to believe that hair style is a matter of personal preference, that hair style is a matter of fashion and/or convenience, and that how people wear their hair is simply a cosmetic issue. Back in the Vietnam War however, an entirely different picture emerged, one that has been carefully covered up and hidden from public view. In the early nineties, Sally [name was changed to protect privacy] was married to a licensed psychologist who worked at a VA Medical hospital. He worked with combat veterans with PTSD, post traumatic stress disorder. Most of them had served in Vietnam. Sally said, “I remember clearly an evening when my husband came back to our apartment on Doctor’s Circle carrying a thick official looking folder in his hands. Inside were hundreds of pages of certain studies commissioned by the government. He was in shock from the contents. What he read in those documents completely changed his life. From that moment on my conservative middle of the road husband grew his hair and beard and never cut them again. What is more, the VA Medical center let him do it, and other very conservative men in the staff followed his example. As I read the documents, I learned why. It seems that during the Vietnam War special forces in the war department had sent undercover experts to comb Native American Reservations looking for talented scouts, for tough young men trained to move stealthily through rough terrain. They were especially looking for men with outstanding, almost supernatural, tracking abilities. Before being approached, these carefully selected men were extensively documented as experts in tracking and survival. With the usual enticements, the well proven smooth phrases used to enroll new recruits, some of these Native American trackers were then enlisted. Once enlisted, an amazing thing happened. 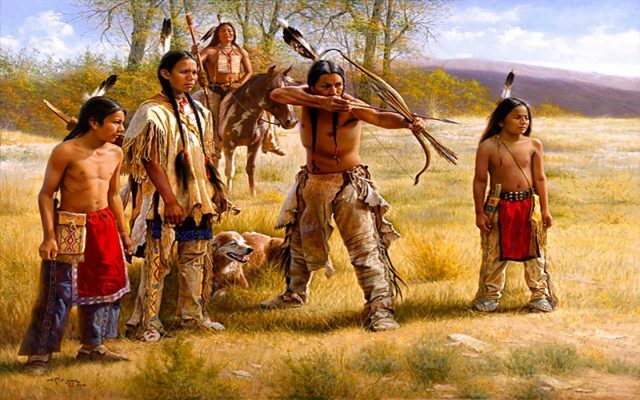 Whatever talents and skills they had possessed on the reservation seemed to mysteriously disappear, as recruit after recruit failed to perform as expected in the field. So the testing institute recruited more Native American trackers, let them keep their long hair, and tested them in multiple areas. Then they would pair two men together who had received the same scores on all the tests. They would let one man in the pair keep his hair long, and gave the other man a military haircut. Then the two men retook the tests. Time after time the man with long hair kept making high scores. Also, time after time, the man with the short hair failed the tests in which he had previously scored high scores. The recruit is sleeping out in the woods. An armed ‘enemy’ approaches the sleeping man. The long haired man is awakened out of his sleep by a strong sense of danger and gets away long before the enemy is close, long before any sounds from the approaching enemy are audible. In another version of this test the long haired man senses an approach and somehow intuits that the enemy will perform a physical attack. He follows his ‘sixth sense‘ and stays still, pretending to be sleeping, but quickly grabs the attacker and ‘kills’ him as the attacker reaches down to strangle him. The mammalian body has evolved over millions of years. Survival skills of human and animal at times seem almost supernatural. Science is constantly coming up with more discoveries about the amazing abilities of man and animal to survive. Each part of the body has highly sensitive work to perform for the survival and well being of the body as a whole. The body has a reason for every part of itself. Not only does hair in people, including facial hair in men, provide an information highway reaching the brain, hair also emits energy, the electromagnetic energy emitted by the brain into the outer environment. This has been seen in Kirlian photography when a person is photographed with long hair and then rephotographed after the hair is cut. Cutting of hair is a contributing factor to unawareness of environmental distress in local ecosystems. It is also a contributing factor to insensitivity in relationships of all kinds. It contributes to sexual frustration. In searching for solutions for the distress in our world, it may be time for us to consider that many of our most basic assumptions about reality are in error. It may be that a major part of the solution is looking at us in the face each morning when we see ourselves in the mirror.